The Crown of Bolesław I the Brave (in Polish: Korona Chrobrego, also known in Latin as the Corona Privilegiata) was the coronation crown of the Polish monarchs. The origins of the Polish crown are shrouded in mystery. According to legend the story dates back to the Congress of Gniezno in the year 1000, when Bolesław I the Brave, Duke of Poland, received from Otto III, Holy Roman Emperor a replica of the Holy Lance and a crown, both symbolising royal power. The crown was lost in the course of history, maybe taken away to Germany in 1036 by Queen Richeza. It was only in 1320 that a new set of regalia was prepared for the coronation of King Ladislaus the Short and survived until the 18th century. The crown along with the crown jewels was kept in the cathedral treasury at Wawel Castle. During the reign of the Jagiellon dynasty it was moved to the Crown Treasury of the castle. 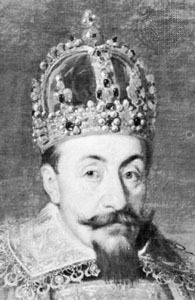 The crown was often removed from the Wawel, for example in 1370, when Louis I of Hungary took it away, returning in 1412. In the 17th century the crown was moved to Warsaw for the coronations of the queens. During the Swedish Deluge in the years 1655-1661, the crown was hidden away in Stará Ľubovňa Castle in today's Slovakia. In the 18th century it moved around again, particularly to Silesia and Moravia. Although returned to Wawel Castle in 1730, only three years later it was taken again to Warsaw. In 1734 the crown was left at the Pauline Jasna Góra Monastery, where it remained until 1736. On the occasion of the coronation of Stanisław August Poniatowski on November 25, 1764 in St. John's Cathedral, Warsaw, the crown was transported from Kraków to Warsaw for the last time. It returned to Wawel Castle where it remained until its theft. The seizure of Kraków by the Prussian army in 1794 had dramatic consequences. The crown treasury was plundered and the royal insignia robbed and later melted down on the order of the Prussian king. Out of the gold, a number of coins were minted. Of all the Polish crown regalia, only the sword Szczerbiec would survive. Based on historical drawings, paintings, descriptions and using a number of Prussian coins believed to have been minted from the gold of the crown in 1811, a team led by Adam Orzechowski of Nowy Sącz produced a recreation in 2001-2003 . The crown was 10 inches high, with 7.8 in. external diameter and 7.3 in. internal diameter, weighing around 2.82 pounds . The replica crown is made out of 21 oz . gold, 21 oz . silver, 11 synthetic rubies, 88 emeralds, sapphires and garnets 0.5 to 1 in. in diameter, 184 gems 0.15 to 0.2 in. in diameter, 80 pearls, and 5 square feet (0.46 m2) of royal purple silk velvet, which is probably very similar to the dimensions of the original crown. ^ a b "Zarys Historii Regaliów Królestwa Polskiego" (in Polish). Historia Repliki Polskich Insygniów Koronacyjnych. Retrieved 2010-08-04. ^ "Kradzież i Zniszczenie..." (in Polish). Historia Repliki Polskich Insygniów Koronacyjnych. Retrieved 2010-08-04. ^ "Idea Odtworzenia Regaliów" (in Polish). Historia Repliki Polskich Insygniów Koronacyjnych. Retrieved 2010-08-04. ^ "Jak Powstawały Repliki" (in Polish). Historia Repliki Polskich Insygniów Koronacyjnych. Retrieved 2010-08-04. Karol Estreicher. The Mystery of the Polish Crown Jewels. London, Alliance Press Limited. 1945? Lubomirski is a Polish princely family. The Lubomirski family's coat of arms is the Drużyna coat of arms, which is similar to the Szreniawa coat of arms but without a cross.